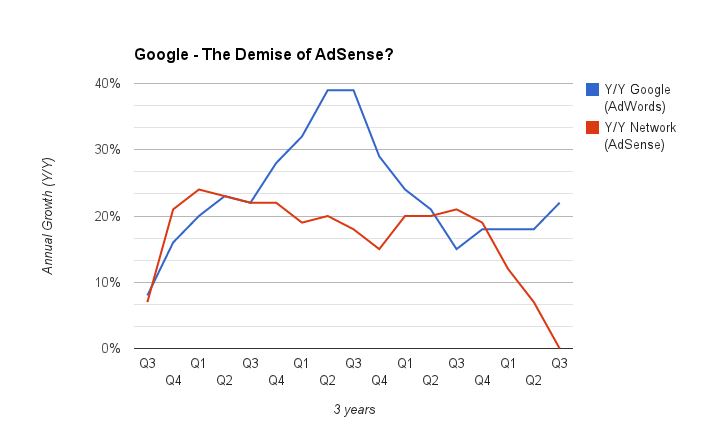 AdSense is the red line and it's been plunging for three quarters. Googgle's [$GOOG] fourth quarter 2013 financial report is due after close of markets tomorrow (January 30) and the numbers I'll be looking at will be for its AdSense advertising network -- about one-third of total revenues -- which has been plunging for the past three quarters. AdSense revenues are generated by showing Google ads on third-party web sites. Large media companies such as New York Times are part of the AdSense network. There's also lots of smaller publishers that rely on the nearly $13 billion that Google paid out in 2012. If there are problems in generating AdSense revenues, it will affect many media companies, too. It seems Silicon Valley reporters would rather follow a car that drives itself than follow the money.